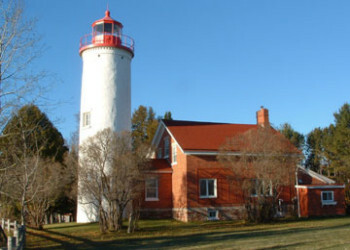 Jacobsville Lighthouse Inn is an opportunity to stay at the newest Lighthouse B&B on Lake Superior, Located in a quiet remote location. A place to relax, unwind and forget about the hectic world outside. There is no TV or telephone in the rooms to cause distraction or disturbance. Tour 1888 Church and Jacobsville School, Go on boat ride. Books and magazines are available. We have a quiet time from 10:00 P:M till 6:00 A:M. Coffee, tea, hot chocolate are available. If you are lucky you may see one of the bald eagles swoop by from one of the 2 local nests. Public boat ramp and park 1 1/2 miles away. Basic rates $150.00 to $230.00 per night, see rates and information page for for more details. Guest rooms have seperate private entrance. Because the house is completely carpeted in a light beige, we ask that you bring other shoes or slippers to wear for your stay. To make reservation call 906-523-4137 or send email to mditty23@netzero.com and request a reservation form. With 5 unique guest rooms, 1 with a sitting room with a simulated fire place. 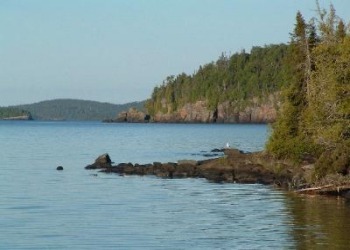 on 360 feet of lake shore of Lake Superior, This large bay (Keweenaw Bay) off the east side of Michigan's Keweenaw Peninsula. A Circle Tour Must stay! The Pine Mountain Music Festival is held every summer and brings classical music, opera, and voice/instrument classes to the area. Public boat launch nearby provides ample opportunity for fishing and water skiing. The Multi-Cultural Festival takes place in Houghton on September 18th. Hunting season opens for deer, partridge, geese and ducks. There are multiple opportunities for skiing within close proximity at Porcupine Mountain, Mt. Bohemia & Mt. Ripley. Also nearby are extensively groomed trails for cross country skiing and snowmobiles. Pine Mountain - several nearby lakes hold fishing tournaments throughout the season.